I started “$5 Fridays” to inspire people to support farm animal rescue and advocacy organizations. Every Friday, I select an organization and kindly ask everyone to donate $5 to it. Many people don’t have a lot to give but most people can give a little. If we all donate $5, it will add up and help support animals. 1) Donate $5 directly to the $5 Friday pick via their website. 2) Post the organization’s name and your donation amount in the comments section below so we can keep a running total of donations. I confirm our total with the featured organization the following day. I interview organization leaders, speak with volunteers, read websites and Google reviews, check social media activity, review the organization’s financials, and think critically about every decision. I focus on organizations that can quantify the effectiveness of their work and make the biggest impact for animals. Farm animal rescue and advocacy organizations rely on our generosity to propel their work. Whether it’s providing humane education to students, designing and printing veg starter kits, launching online pro-animal advertisements, employing undercover investigators, organizing boycotts or protests, advocating for pro-animal legislation, or providing medical care, food, and shelter to rescued animals, it costs money to run these organizations. Our donations directly help them save more animals’ lives. Our new $5 Friday total is $12,370 donated to help animals! What makes a farm animal sanctuary special? They understand the importance of blending animal rescue with humane education in schools and frequent tours, articulate their mission, communicate and actively pursue goals, manage their finances, provide transparency, maintain an active social media presence, reply promptly to requests, show appreciation to volunteers, gain the trust of supporters, and maintain a positive and professional image in all areas. They are competent, relentless, open-minded, creative, and strategic. To decide where to focus my energy, I make a mental note of every interaction with farm animal sanctuaries. It is these interactions and a thorough evaluation process that form the basis of my beliefs about these sanctuaries and their potential to save lives. The organizations I’m spotlighting today have consistently exceeded expectations. For these reasons, I’ featuring them as $5 Friday picks again. This isn’t something I planned but rather something they earned. I have the highest degree of confidence in these sanctuaries. It’s a $5 All-Star Friday — four sanctuaries at once! or you can donate $5 to each one! To demonstrate how much I believe in these sanctuaries and to show how much I appreciate them, I’m donating $1,000 in animal advocacy t-shirts, jewelry, etc. ($250 to each sanctuary). The packages are in the mail. I’m also paying for targeted advertising to reach 50,000 non-veg people with a photo and story of a rescued animal from each sanctuary on Animals of America to inspire people to stop eating animals. I hope my experience with these sanctuaries inspires you to donate $5 to allow them to continue to rescue farm animals and provide humane education. Click here to read the $5 Friday story on Blackberry Creek Sanctuary. Click here to donate $5 to Blackberry Creek Sanctuary. Click here to read the $5 Friday story on Indraloka Sanctuary. Click here to donate $5 to Indraloka Sanctuary. Click here to read the $5 Friday story on Uplands PEAK Sanctuary. Click here to donate $5 to Uplands PEAK Sanctuary. Click here to visit Wildwood Farm Sanctuary’s website. Click here to donate $5 to Wildwood Farm Sanctuary. Let’s show these incredible farm animal sanctuaries how much we appreciate everything they do to make the world a more humane place for animals by empowering them to do even more. Please list your donation amount in the comments section below or on my personal Facebook page so we can track our total. Thank you for participating in $5 Friday! Farm animal sanctuary picks now receive additional exposure as regular features on Animals of America! Please “like” our page, request notifications, and get your daily dose of inspiration. Uplands PEAK is honored to be included in the company of these amazing sanctuaries! We are so grateful for this recognition and we will always strive to live up to these attributes! Thank you, Andrew for granting us this platform to further our mission and vision of kinship. Thank you to everyone in this community for your commitment to helping animals. It is each of you that makes it possible for PEAK’s success…… Thank you. My pleasure. It’s the least we can do given how much you do for animals. I hope it’s a big day for all of you. You deserve it. Everyone at Blackberry Creek is honored to be a part of this group of sanctuaries who are making the world a kinder, more informed, and more compassionate place. Thank you, Andrew, for seeing the best in us and encouraging us to keep striving to meet those lofty goals of great non-profits. You are an inspiration to us and encourage us to keep giving it our all. Thank you with our utmost sincerity! Much deserved. Very kind of you. Thanks for all you do! Donated $5 to Indraloka Animal Sanctuary. Just donated $5 to Blackberry Creek. They all are very worthy, but Blackberry is new and they are my neighbors, so I chose them. You have awesome neighbors Lori! Yahoo! Thank you so very much, Lori! 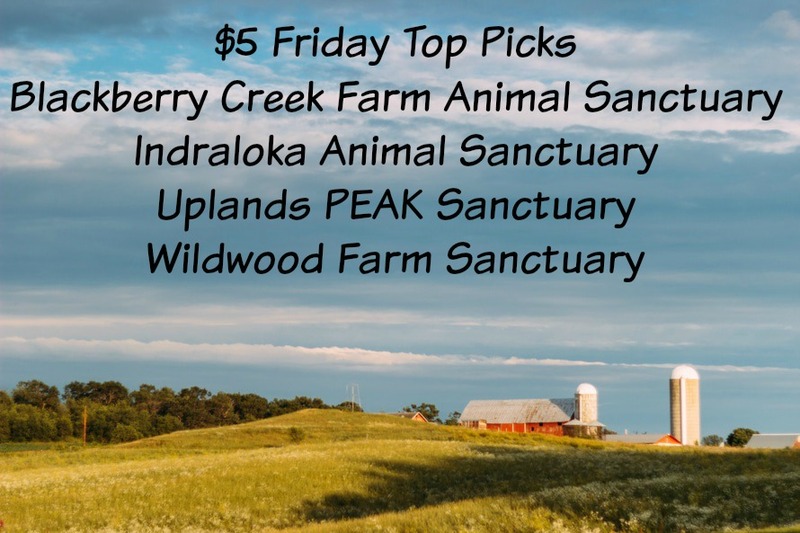 Wildwood Farm Sanctuary is honored to be included along side these amazing sanctuaries during your $5 Friday promotion. Thank you so very much for all you do Andrew, it takes all of us working together to make this world a more compassionate place for animals. Thank YOU Shauna. You have more than earned the support. Aloha from Kauai Andrew. I just donated $5 to Wildwood. Mahalo for all you do! Aloha Leslie! Thank you so much for supporting Wildwood. They are amazing! So kind of you to take the time to donate! We just donated $5 to Wildwood Farm Sanctuary. Awesome, thank you Melissa and Matt! Very generous of you! Thank you for supporting $5 Friday picks! Too hard to choose just one as all four are doing such great work. Thank you for your support. They will appreciate it! LOVE that you’re inspiring so many to support these deserving sanctuaries! I signed up for a monthly donation to Bkackberry Creek. It’s not much, but over the years I hope it will make a small difference. That’s awesome Wendy! I know they will really be excited and grateful! It will make a huge difference! Right now (at 3 months old), $5 feeds a piglet for five days! Thank you, Wendy! We donated $5 to each sanctuary! That’s amazing. Thank you so much! Thank you! We appreciate it very much! Thank you Andrew for featuring these 4 well-deserving farm animal sanctuaries and once again giving them this incredible opportunity which helps them to continue their amazing work. I have seen first-hand the hard work and heart that goes into the day-to day operations of a sanctuary. With your commitment to their success, these sanctuaries stories are shared across the country inspiring people to take action. As a volunteer and supporter of Blackberry Creek, I can tell you that it is an honor to be associated with you and all of the other farm animal sanctuaries you feature. As each and every sanctuary tirelessly continues working to change how society treats the beautiful creatures who share our world, I know they are grateful to have you in their corner. I have donated $5 to each of the sanctuaries featured today and will continue to pray that some day mankind can truly live up to its name: man = kind. Thank you, Kim!!! We appreciate your support and are so glad to have you share our vision and commitment! Thank you everyone for participating in this week’s $5 Friday. We donated $151.50 to Indraloka, $362.50 to Blackberry Creek, $162.50 to Uplands PEAK, and $135 to Wildwood. I also donated $1,000 in animal advocacy merch ($685 my cost) for re-sale, auctions, or to give to vols. and $50 in paid advertising on Animals of America for these sanctuaries. Our final total is $1,541.50. I really appreciate everyone’s generosity. I hope to see you again Friday. Thank you. ← Does Eating Animals Make Someone a Bad Person?